The Kilimanjaro Lemosho Route is the best ascent route but this offers the complete Kilimanjaro experience, more acclimatisation time, more culture, more spectacular scenery and even a night in Kibo caldera. Note: this itinerary ascends via Stella Point and NOT the Western Breach and is for that reason considered to be a safer route. Walking time: 4 hrs. ; elevation change: +370 m.
Walking time: 6-7 hrs. ; elevation change: +880 m.
After breakfast, we shall walk through the remaining rain forest to the giant moorland zone. This is a full-day trek with an altitude gain of 880 m. Lunch will be taken at about the halfway point, a beautiful valley just outside the Shira Crater. After lunch, we cross into the Shira Caldera, a high-altitude desert plateau that is rarely visited. Shira is among the Kilimanjaro volcanic cones, and is filled with lava flow from Kibo Peak. The crater rim has been decimated by weather and volcanic action. You also will be able to view the western side of the Mt. Kilimanjaro summit. Walking time: 5-6 hrs. ; elevation change: +340 m.
Walking time: 6 hrs. ; elevation change: +110 m.
After breakfast you will start walking in moorland and enter the alpine desert which joins at a junction with the Machame Route. You then will reach the Lava Tower (4,600 m.), where lunch is normally taken. Also, you are advised to pass there for acclimatization; thereafter, you will go down to Barranco where along the way you will able to see Lobelia deckenii and Senecio lobelia. 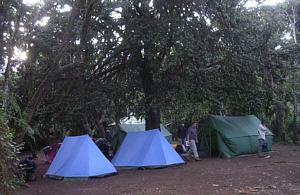 Overnight will be at Barranco Camp. After breakfast you will continue walking by climbing a very steep rock called “Breakfast Rock” for about one hour. Then you will walk for a short distance before dropping to Karanga Valley, which is the last water point. You will camp overnight at Karanga Valley. After reaching the summit, you will return to Barafu and rest approximately one hour. You then will take breakfast or lunch, depending on the time. You will pack your gear. 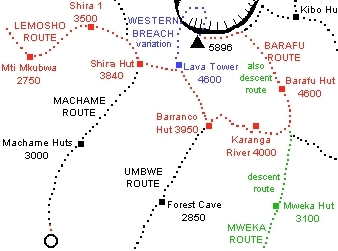 Thereafter, we will descend via the Barafu Route to Mweka Camp for about five hours. Overnight will be taken at Mweka Camp. After breakfast we will descend through natural forest for about 10 km. to reach Mweka Gate. After finalizing all issues at the Mweka Gate Park, our representative will return you to the Zebra Hotel. 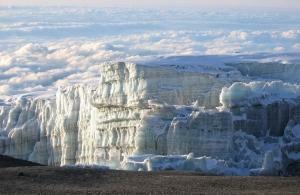 A Seven-Day Lemosho Route Itinerary also is available, which requires walking from Barranco Hut to Barafu Hut in one day.